Friday night: Snow bursts accumulate a coating to 2 inches, highest amounts in higher terrain. Lows in the 30s. Saturday: Early morning snow showers depart for some sun and wind, highs in the 40s. Sunday: Pleasant sun, highs 55 to 60. Our coastal storm continues to pull away from us this evening, but we're not out of the woods just yet. Mountain snow showers continue to stay steady with enhanced upslope snow thanks to a strong west wind. Southern New England will see a wintry mix, a few sprinkles lingering, and some breaks in the clouds before snow moves in. 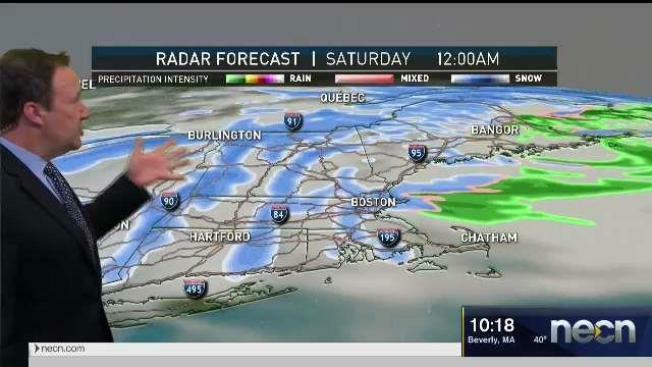 The thump of snow will be for all of southern New England as temperatures fall and a shortwave moves through tonight. This snow will be short-lived and will lead to about 1-2 inches of snow between midnight and dawn Saturday for the Worcester Hills, 3-4 inches across southern New England, and scattered coatings around lower elevations, including Boston. Anything that accumulates won't stick around long once the sun pops up and temperatures warm into the 40s. Northern New England in the mountains is still looking like another several inches of snowfall and especially on the western slopes. Snow tapers off by the late afternoon but it stays very windy. The wind will stay strong from the west and the closed low moves farther away Saturday. Gusts may be between 30 and 40 mph from the west, then northwest in the evening. Peak winds 50-60 mph possible in the mountains. Good news is that the sunshine breaks out for all, highs in the 40s. Sunday will be the pick of the weekend with highs in the 50s and sunshine. A cold front will bring a wintry mix chance on Monday along with colder temperatures. Highs go from the mid-40s Monday, to the 30s on Tuesday. High pressure takes over Tuesday through early Friday and temps gradually warm under the late March sun. We will reach the low to mid-60s Friday and Saturday, staying spring-like into Sunday as well as a few showers move through.